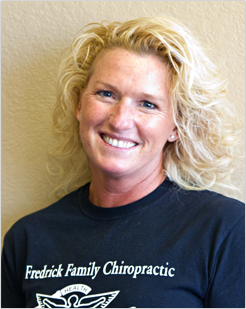 Fredrick Family Chiropractic was established in October of 2000. The office was originally on South Lincoln Road and started with just Dr. Fredrick and one secretary in an 800 square foot space. The business grew quickly and within a couple of years it had outgrown its location. In 2005, Fredrick Family Chiropractic relocated to its current location at 2601 1st Avenue North. The office has continued to flourish, expanding to include massage therapy which allows us to take care of many of the area's athletes as well as a host of other patients. We emphasize the family in Fredrick Family Chiropractic, welcoming athletes, elderly, children, newborns, and everyone in between. Call us at 906-233-9390 to set up a free consultation with Dr. Fredrick to discuss your problem or health goals. 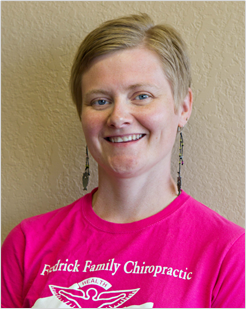 See how the friendly staff at Fredrick Family Chiropractic can help you! Dr. Dawson Fredrick was born and raised in Ladysmith, Wisconsin. As a youth he enjoyed playing football and wrestling. He was first introduced to Chiropractic as a result of injuries he sustained playing these full contact sports. He was always amazed when he would go to his chiropractor with back and neck pain that he would see almost instant results without taking any medications. By the time he graduated from high school, Dr. Fredrick knew what he wanted to do - be a Chiropractor! Dr. Fredrick did his undergraduate studies at the University of Wisconsin at River Falls and then attended Northwestern College of Chiropractic in Bloomington, Minnesota. 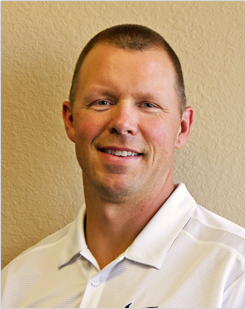 His first position as a Chiropractor was at an office in Green Bay, Wisconsin. While working in Green Bay, he met his wife Tonna, who was from Bark River, Michigan. After a year of working in the Green Bay office, Dr. Fredrick was ready to start his own practice. After looking at several possibilities they decided to come back to where Tonna was from to raise their family. In October of 2000 they opened Fredrick Family Chiropractic in Escanaba, Michigan. Dr. Fredrick enjoys golfing and triathlon and completed an Ironman event in 2012. He also continues to see his own chiropractor on a regular basis. A native of the Upper Peninsula, Tonna Fredrick grew up in Bark River. Tonna has always been interested in sports and physical health, participating in track, basketball, baseball, and cheerleading in high school. Tonna has also been involved with horses since a young age. She started riding when she was three years old and has raced in barrel and endurance competitions. After graduating from Bark River High School, Tonna attended Northern Michigan University and then moved to Green Bay to do counseling work. It was in Green Bay that Tonna met Dr. Dawson Fredrick. Dr. Fredrick was working looking to open his own Chiropractic office and they decided to move to the Upper Peninsula, as Tonna knew it was a wonderful place to live and raise their growing family. As the business continued to prosper, Tonna saw an opportunity to help the family business and be involved with the physical health and body mechanics that had always interested her. She enrolled at the Marquette School of Massage and graduated in 2010. Tonna is both certified and licensed in massage therapy (CMT and LMT). She uses different techniques and is one of the few massage therapists in the area to uses the Chinese Cupping Technique. An athlete herself, Tonna understands the rigors of endurance training and is able to tailor treatment to meet the needs of the individual. In Tonna's words, she "loves the body, how it works and loves helping people feel better". Jennifer Caron grew up in Grand Blanc, Michigan. After graduating from Grand Blanc High School, Jennifer went to the University of Michigan in Flint and received her Bachelor of the Arts in Theatre in 2000. In her last year of schooling at UM-Flint, she was taught about a movement therapy called Alexander Technique, used largely by performers. This shifted her focus to manual therapy. Research into this technique led her to a massage school in the area and to the realization that she possessed a skill to manipulate muscle and provide relaxation and, in many cases, freedom from pain. In 2001, Jennifer earned her certification in massage from the Flint School of Therapeutic Massage. It was at UM-Flint that Jennifer met her husband, Jaime, who is originally from the Escanaba area. She and Jaime have lived together in the Upper Peninsula since 2001. They have a young old son and two huskies. Though Jennifer does not perform anymore, she is involved with the yearly revue put on by The Academy of Dance where her husband teaches. When she is not working she enjoys spending time with her family, knitting, yoga, and running.